Based on very limited observations, it seems that at some point in the 1880s the grips on Victorian swords begin to straighten, and the pommel becomes less prominent. What company initiated this change, and what were the practical reasons? Were there official discussions (either government or manufacturer) regarding these changes? --The examples from the 1880s I have seen tend to be Wilkinson swords, but this does not mean that Wilkinson initiated this change. 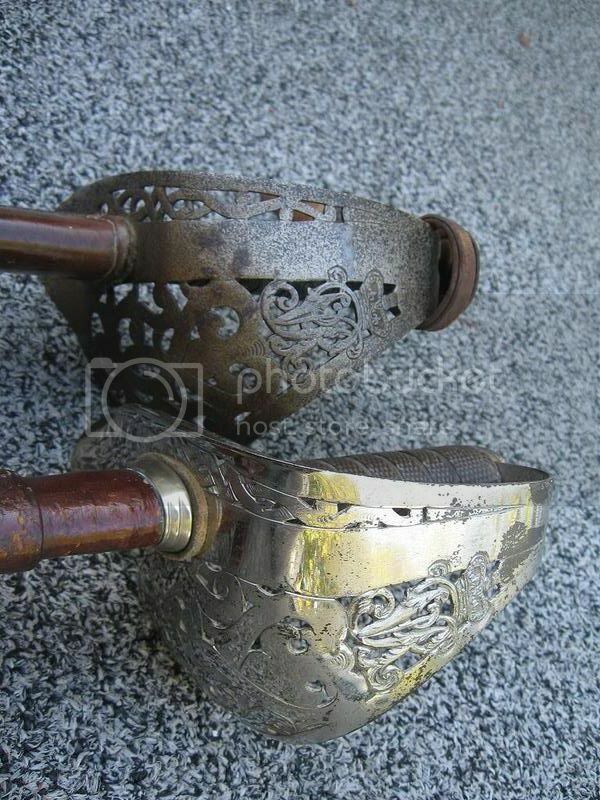 --Perhaps the straighter grip with less pronounced pommel lent itself better to the thrust? Was easier to mass produce? Did not get caught on clothing? --The P1895 and P1897 hilts had the longer, straighter grips with low profile pommels, so it made sense that these would be used on other patterns as well (P1854 Guards swords, P1821 HC swords, and P1821 Artillery Officer’s swords). --The new style was better suited to the straighter blades found on later Victorian swords? Last edited by J.G. Hopkins; 01-24-2013 at 04:59 PM. Reason: Fixed broken image links. I feel that this change in the shape of the grip (and shape of guard) came about from around the 1850's were there was a great surge in The Art of the Fence (fencing and skill at arms) There were in London a number of Fencing Clubs and establishments such as Angelo's in St James's and the Wittington Club. 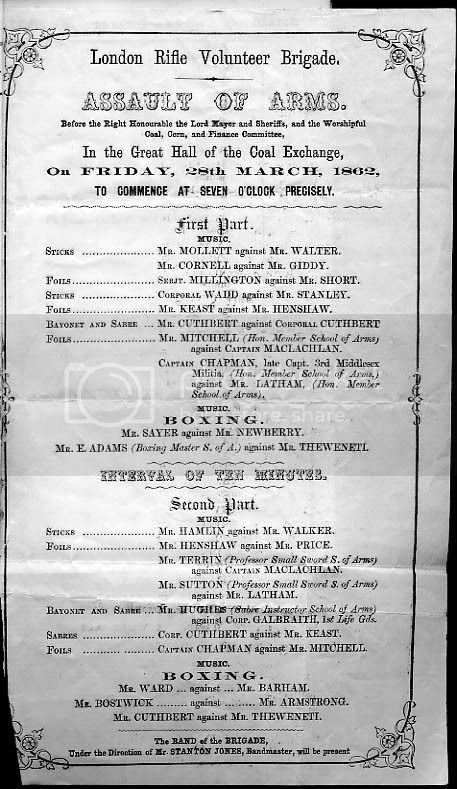 The Whittington Club held regular Skill at Arms evenings including fencing, singles stricks, sword versus bayonet and other feats like silk handkerchief cutting and animal carcass splitting in single stroke. The Wilkinson records from 1850's to 1870's show a number of 'specials' where different shaped grips had been asked for because, I feel, the lessons learned about cut and thrust from the schools of fence. Here is an Officer's regulation sword of twenty or thirty years ago. (My Note:1832 to 1842) It is a specimen, I believe of the worst possible arrangement of hilt, blade and shape that could possibly been contrived. It is crooked but has no regular curve; is wrongly mounted for thrusting and wrongly shaped for cutting. The hilt is so flimsy as to be no protection for the hand and it is made of bad metal badly tempered If you ask me how such a model came to be adopted, I can only answer by a supposition. At that time the three principal purveyors of swords to the British Army were a tailor, a gold laceman and a hatter. I can only suppose that the tailor was the first consulted; if his production was unsatisfactory, the pattern was referred to the laceman; and finally the hatter was called in, who put the crowning touch on the whole." Seriously I do feel that the influence of the proper teaching and interest in the fencing and skill at arms and the understanding of cut and thrust meant that the grip and hilt slowly evolved. I doubt if there is any documentation on the grip and hilt but will have a look. Last edited by Robert Wilkinson-Latham; 02-09-2008 at 02:46 AM. The "beaked pommel" grip has a very weak point at the angle of the pommel with the main part of the grip - at this point the tang tends to bend forwards a little in order to centre itself in the pommel such that the wood is very thin at that point and with the grain of the wood running lengthways along the grip, the beak often tends to break off. Many early 19th century swords where the beaked pommel was very prominent exhibit signs of damage or repair to the beak (see photos). Hence I suggest that the straighter grip designs were meant to overcome this problem. Very very valid reason which added to my thoughts about more scientific use of the sword is probably the reason that the grips and pommels change and became more upright. As you so clearly point out a lot of the style and age of swords you showed on the thread seem to exhibit this weak point at the top of the grip where not only is the original wood core of the grip thin, but water can seep in under the pommel and backstrap and start the tang rusting which equals swelling which equals splitting of the wood grip. I knew this would be an interesting and informative thread! Thank you, Robert and Richard, good points. I had not considered that the integrity of the grip might have been compromised by its very design. These straight grips do seem to be longer than the earlier "beaked" grips, so perhaps there is also something to the influence of the "schools of fence". The longer grip makes it easier to place one's thumb on the backstrap near the guard. Do you have any photos or illustrations of straight grips from the 1850s? Based on my admittedly limited experience, the 1850s seem a bit early for this feature--at least on a large scale. Wilkinson swords (P1854 Infantry Officers' Swords) of the 1880s, and maybe even the 1870s, are the earliest I have seen this grip configuration. Another change in the hilt can be observed in the first two photos in my first post. Notice how the earlier P1845 has thinner and rounder bars on its guard, whereas the P1854 from the 1880s has flatter bars that have a flatter and more rectangular cross-section (and conform more with the steel "Gothic" hilts found om P1827 Rifle Officers' swords and P1854 Guards Officers' Swords). Do people agree that Wilkinson seem to have been the initiator of these hilt alterations? What other manufacturers might have come up with these innovations? What other manufacturers followed suit in the early years of the straight grip? On a tangential note, it is interesting that while the government and its contractors were mucking about with the design of the cavalry troopers' swords, the sword making industry appears to have been largely in control of innovating the half-century of design of the infantry officers' swords. It may be worth noting also that the beak disapears with the adoption of the Reeves type tang on the 1853 lc trooper's swords and on some officer swords. With regard to the cavalry hilt, a substitute for this bracing for the little finger is reintroduced with the 85 as one of the improvements over the 80 and remains until the moulding of the 08 makes it redundant. This may pertain to the present discussion. It is the grip from an 1822 GR IV Infantry Officers sword that I have, which I always thought had an unusually shaped straight-ish grip for the period. The sword is marked to the Coldstream guards, so maybe some officers of more elite regiments had some fencing background? Or maybe he just had large hands. The sword was retailed by Jonston sometime in the late 1820's, so this could possibly be an early example of the "straight" grip. Last edited by MikeShowers; 04-01-2011 at 08:19 PM. Then a completed article by Tony Wolf here, with some images. It is under the 2001 archive. On the pommel evolution, I can see both the contruction weaknesses but also that swords of less slashing characteristic (straighter) and favoring less of a hammer grip in use don't benefit much from the bulbous handle terminus. The svelter beak grips do seem fragile there and I see a lot with loss once the grips start to deteriorate. 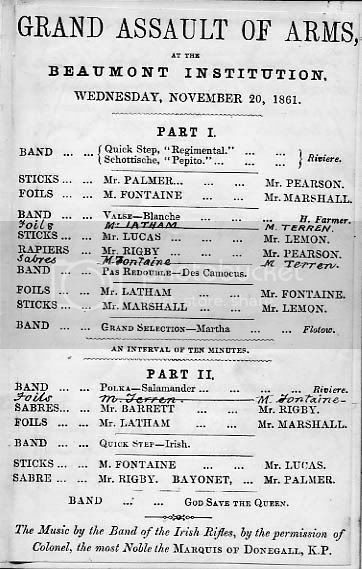 Some interesting London Assault of Arms 1860's (Great Great Grandfather struts his stuff!!) This shows the great interest in the sword and ipso factor how it was designed and performed which brings us back to the grip! Last edited by Robert Wilkinson-Latham; 02-09-2008 at 11:10 AM. I'll have a look amongst my photographs of Wilkinson dated swords and see if I can come up with a chronology of sorts on the grip shapes. Interesting. Here is the same grip damage on a Wilkinson Heavy Cav Officer's. The same sort of characteristic damage evidenced in group of otherwise excellent condition swords is certainly compelling. As always Robert, thanks for that fantastic background material! 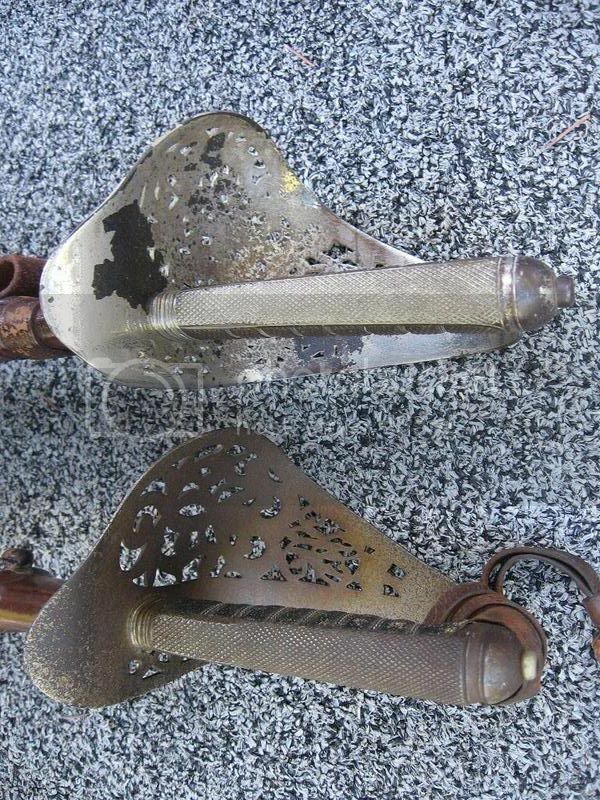 Pre and post circa 1810 grips illustrated here 1,2 and 4 bellied. 3 straight with "beak"
Do you think that variant also serves to allow the officer to lower the point for the charge Richard, by allowing him to slip the pommel into his palm giving him a pistol like grip? Can anyone say whether or not the changes in the hilt were first seen in infantry officers' swords or cavalry officers' sword, or if they changed simultaneously? 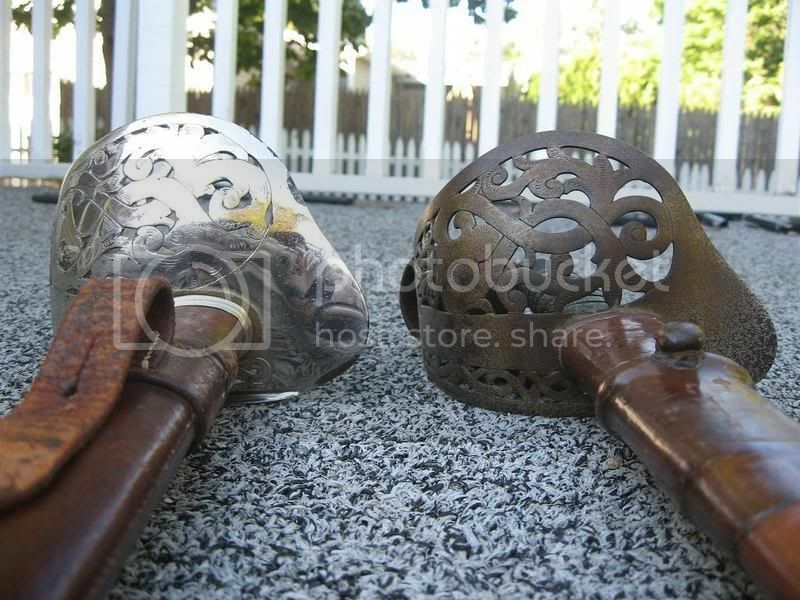 The first is an 1821 Pattern Cavalry Officer sword with Patent Tang. This belonged to Cornet W.H. Horne (commissioned 1860), and the blade is nicely marked to the 15th Hussars. Later he transferred to the 2nd Dragoon Guards and the sword was presumably re-hilted to the honeysuckle pattern Heavy Cavalry type at that time. Thank you for your very instructive posts. Your photos not only depict the evolution of the hilts, but the variety of materials used for the grips. Could you remind me of the composition of the grip material found on the first two swords you have posted? Could you remind me of the composition of the grip material found on the first two swords you have posted? I believe it's rosewood. I'm sure later examples may have been of some sort of early pastic composite, though, similar to bakelite. I forgot to add a pic of another unusual sword - a "Toledo" pattern blade made to special order for Sir Norman William Drummond Pringle, Colonel, the South Staffs Regt (7th Baronet Stichill). This is a steel version of the P1854 infantry hilt matched with a blade consisting of twin edge fullers (similar to the Highland Officer's blade) but ending in a flattened diamond section - quite a handsome combination! This was made in 1885. I was browsing the internet last night in search of images of P1895s and P1897s. I was looking at a George V P1897 and noticed that the openings in the guard looked very small. At first I assumed that this was due to a poor re-plating job. Later I noticed the same difference between my P1895s and P1897. I decided to snap a few pics to illustrate how the openings on the guard of the P1895 are much larger than those on the P1897. One of the complaints against the P1822/45/54 infantry officer's sword was that the guard did not provide sufficient protection due to the large openings in the "Gothic" hilt. I imagine that the down-turned guard was not the only intentional modification made to the P1895 guard, and that the smaller openings were intended to enhance the already improved hand protection offered by the steel hilt, at least as far as Wilkinson-made hilts. The openings are made smaller by fattening the scrolling ribbon design that comprises most of the guard. I wonder if this difference can be seen in hilts produced by other makers?